Ashna Secure (Ashnaimen) is the leading information security company in Iran, established in 2000. Ashna Secure offers its unique methodology with specialized security services and products to domestic and international market. Ashna Secure provides security standards consultancy like ISMS, PCI/DSS and ITIL, penetration testing, data center and smart card solutions. Ashna Secure Company as a leading company in the field of information security and with capable human resources was established in 2000 to participate in domestic and international arena in the field of Information Technology. Close cooperation with organizations and companies which have sensitive information security at national level is the proof of this issue. Ashna Secure Founders were some graduates of Electrical Engineering (Telecommunication) and Computer Engineering of technical Faculty of Tehran University. Because of the importance of information security, legal issues and customized implementation of information security standards and instruments, they decided to establish a private company in this field. 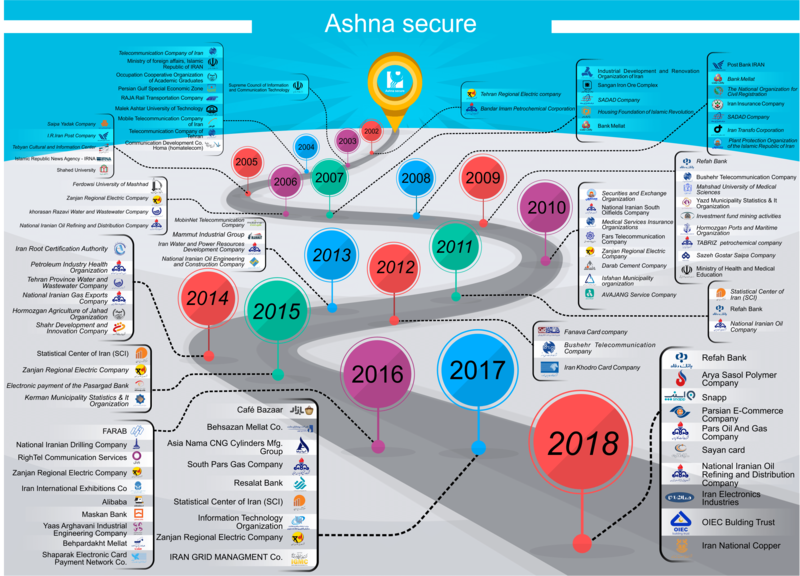 Ashnasecure is known in Iran market as a leading company in the field of consultancy, planning and implementation of information security management system (ISMS) and information technology management system (ITSM) which “customers” in website is a big proof of this. Ashna Secure Company developed a specific methodology in implementing information security management system (ISMS), Penetration Testing (ASPTM) and Information Security architecture design which is compliant with the Iranian organizations and companies’ culture and structure. This methodology creates transparency as well as the possibility of transferring technical knowledge to the organization and the effectiveness of its implementation. Since undoubtedly implementation of information security management system standards In addition to a complete understanding of ISMS, requires high technical knowledge in areas related to information security, Ashna Secure Company since its establishment invested considerable in technical knowledge such as penetration testing, Risk Assessment, Security vulnerabilities assessment, source code security audit and etc. and now Ashna Secure has a penetration testing private lab. Seminars, professional training courses and some of its related services are indicative of the capabilities of this company. The first information security management system lead auditor course based on BS7799 standard and the first penetration testing course by the name of CPTP held by Ashna Secure in 2004 in Iran. It should be noted that the first conference in the field of Data Center held by Ashna Secure in collaboration with Ashna Group in 2009. The company also is the first and currently the only company in the field of information security consultant companies which got the certificate of ISO 27001 international standard. Due to the large field of information technology, Ashna Secure more than concentrating on technical issues, negotiated with international companies for the use of new technology and made agreements with international companies like Guardsquare, NSS Malaysia, Telegartner and etc. Ashna Secure Company has serious accuracy in the selection and identification of its personnel which involved in projects and the base of acceptance of our experts is very high degree of competence. Most remarkable, Ashna Secure trained more than 100 experts in the field of information security within the company’s activities in these years. Ashna Secure Company in offering their services as critical to their specialized knowledge of its personnel, constantly increasing awareness and knowledge of the employers is also the epigraph of its work; because effective implementation of management systems is related to the promotion of education and culture of the organization’s human resources. So Ashna Secure beyond the technical approach works on system approaches and cultures at different levels of organizations. Ashna Secure Customers believe that the company not only secure their services with the best quality and highest accuracy, but also create new and mature work culture among its customers at all levels of the organizations.